If you’re stuck for a gift for a friend or loved one, what about a Christmas hamper? But rather than splashing out on a pricey item that has items nobody wants or eats (I’m thinking of Gentleman’s Relish here), why not put together your own, especially tailored to their likes. The container you use doesn’t need to be a traditional wicker basket – although if you do want one, you can find many online companies which sell them, or they are available in stores such as Ikea, Asda, Poundstretcher and others. Alternatively, you could choose a receptacle which has some particular connection with the person for whom you’re making it. For instance, if they’re a keen gardener, why not use a pretty watering can, if a sportsman, then a large ball cut in half might be a nice idea. If a traveller, you could buy an old battered vanity case and put stickers over it. The main thing is to use your imagination to make the hamper really individual. Once you have decided on the container, you then need to line it. This will show off the produce you put in it to the very best effect. It doesn’t have to be fiddly or difficult or involve any sewing if you don’t wish it to. Merely select a material in which you can nestle the foodstuffs to help make them look really special. Suggestions might be a piece of black velvet, crushed tissue paper, cellophane and raffia, silk satin, polystyrene ‘worms’, shredded coloured paper and so on. Again, try to choose something in keeping with the sort of gift you wish to present. If you are giving to a chocoholic, you could select every product with a chocolate theme, for instance, chocolate scented candles, chocolate bath bombs, drinking chocolate, a Chocolate Cosmos plant, chocolate body paint - and of course a lovely great box of chocolates as the star attraction! You could then make the container look like a huge box of chocolates with chocolate coloured tissue paper and silver foil inside and tie it with a red ribbon. For a real food connoisseur, delectable fine foods might be good option, presented in a tasteful way. Instead of using a container, you could wrap each item, grading by size, in good quality brown paper tied with string. Pile them squared parcel by squared parcel and secure tightly with raffia. For this kind of gift, you will find many award-winning foods are able to be posted by mail-order, or visiting your local delicatessen will give you lots of ideas. Classic items might include great cheeses, gourmet oils, good coffee, truffles, wild Scottish salmon etc. If you have the time, then a hamper full of your own home-made produce can’t be beaten as a perfect gift for parents and grandparents. They above others should appreciate your time, effort and loving care. 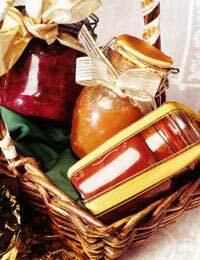 Good choices to include here would be home-made jams, preserves, pickles, mincemeat, biscuits, chocolates and fruitcake. A final idea is instead of theming the hamper by food content, is to theme it by colour. You could choose the favourite colour of the person you are giving to, their favourite football club, or else have fun with Christmas colours of red, green and gold. You could fill with Christmasy treats such as tiny, special mince pies, mini bottles of Christmas liqueurs, chocolates, shortbreads and cheeses – each wrapped in colour-themed tissue. Whatever you decide, making a hamper with a specific person in mind is a wonderfully rewarding experience – both for the giver and the receiver. If you want to give something smaller, but still with a personal or homemade touch, why not send a gift in a Christmas cracker, made by your own fair hands!